Forget New Years, Loy Kratong or the thousands of other celebrations in Thailand...Father's Day is Thailand's most celebrated festival! December 5th is the King's birthday and as such is the nation's daddy day. This year is particularly poignant as it marks the King's 80th birthday and his 60th year on the thrown. One of the most special things about living in Thailand is to experience how patriotic and monarchistic Thais are..it's actually a beautiful thing. Thais love their king as if he was part of the family. He is literally the father of the nation. At around 7 pm the entire nation was syncronised by lighting candles and singing King Bhumibol's official song. In our village (and apparently country wide) all the lights are turned off at the ceremony and the live radio from Bangkok is turned on (so we know when to sing). 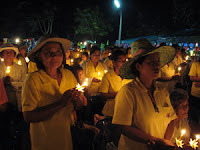 The village officials get on stage and light their candles, passing the flame on to the people who then light each others candles. Looking at hundreds of lit candles in the dark and listening to the impassioned singing of the people to their king is quite incredible. Of course the lady leading the singing in our village was quite ear piercing and grimace worthy. It's the first video I've taken so excuse the quality. Play it on the highest volume possible to get a taste for the real experience! 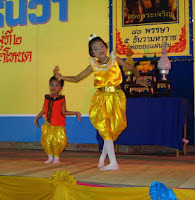 The festival also hosted lots of kids dancing both traditional style and of course 80s Madonna style as per norm with girls of about 10 dressed in stilettos and fish net shirts inducing much cringing whilst watching them dance. Living in the south we are often treated to Manora dancing. It is captivating and sporadic and the music somewhat haunting. Listen to this to teleport to the southern regions of Thailand. You have just solved a mystery for me. We walked past loads of people with their candles lit but we didn't know why they were lighting them. I thought it had something to do with the King. Thank you for the explanation on the festivities!! And the video...The dancing pretty cool - if only the little girls would learn that one vs the "madonna" style kind of disturbing as you mentioned. I thought there would have been millions of candles in BKK! Very pretty. Good deduction on the King thing!! H - that was just a little snippet! You can imagine what 10 minutes of that singing does to your eardrums. People don't even seem to notice how horrible it sounds, it's rather amusing.